Peerly Human is a community of respect and regard for all members of the Human Family. We welcome people from every walk of life and with every kind of life challenge. 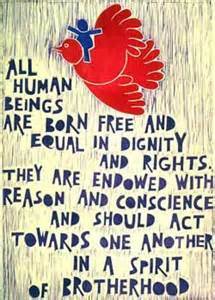 Our primary purpose is to live with dignity and conscience in harmony and equality with other human beings. The only requirement is a willingness to respect the dignity and conscience of other community members. Above all, we cherish and protect our common need to find acceptance and belonging in a community of peers. We are not a healthcare or social service organization. No one may attend in a professional capacity, only as a peer. We have no experts or paid staff. Rather, we are fallible people of good will and conscience. We support these efforts with our own energy and resources on a voluntary basis. We are doing the best we know how. Our sole ambition is to learn together and share with others who are willing to join us on the human journey. 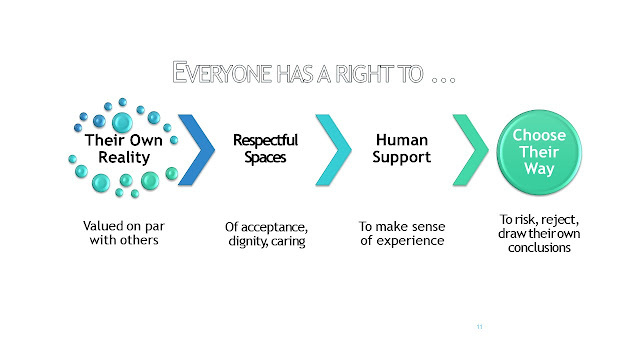 To create an active, vibrant 24/7 community on-call that feels like human family and advances human rights. To offer a rich array of drop-in spaces for people to connect around shared values, needs and interests. If there's an ongoing conversation, pause for new arrivals every 15-20 minutes. Invite them to say hi, introduce themselves and join in as they feel ready. It's a community - not a support group or therapy session. Encourage equality, self-determination and personal conscience, Avoid judging, competing, or advising others. Build a conversation. Invite participation, topics, check-ins, feedback, and reflections. Be kind to your audience. Generally, 3-5 minutes is about as long as anyone can listen to a single person sharing. Be mindful of 'two-somes.' It can be easy to forget that there are several people on the call. Ask others to join in, instead of If you find yourself saying something after every person talks, it might be time to step back. If you get upset, it's fine to hang up if you need to. We hope you'll let us know what We'd like to work it out and help to make it work for you. We technically end the call at the stated time. But people are willing to keep talking informally for as long as they like until there's another call. No pros, no cops, no 911. Every living system must protect the core of its existence. We live in a society that has become addicted to the fantasy that there is some external benevolent authority that has all the answers and can fix all our problems. The only barriers, we are told, is lack of funding or lack of insight. Either we need more professional services or we don't use them right due to bad attitudes, genetic defects or chemical imbalances. We are run by ourselves and for each other. No one is paid to be here. We all have our own reasons for being here. We all have needs we would like to see met here. Share the air - step up, step back. Set aside social labels, reputations and roles. We meet each other as human beings. We speak for ourselves from our own experience – not as experts, authorities or professionals. Give each other a break. It takes risk to show up and speak up. It's unlikely anyone will get it right on the first few tries. No one gets it right all the time. One person, one vote. Outside opinions, credentials and authorities carry no special weight here. Our ultimate authorities are personal conscience and lived experience. When issues affect our group relationships, we rely on group conscience and group experience. We don't police each other. We are all here as responsible adults. We are all accountable to treat each other in human-rights informed ways. Put people first. The purpose of rules is to meet human needs; they are an aid not a strait-jacket. We don't call in outsiders to police our membership. We will never learn to live together and manage our own affairs until we actually take responsibility to learn to live together and manage our own affairs. Put principles first - before personalities, labels or reputations. A lot of us have been kicked out of other social groups. Both the pain of exclusion and its harmful affects cuts deep. Here, we reverse that. We make a conscious effort to include rather than exclude. We try hard to make space for all voices and to appreciate the gifts that each of us bring. Everyone has a right to their own reality valued on par with others. Listen to understand, rather than to judge or enlighten. Notice and celebrate what we share in common. Instead of arguing over who is right, we learn from the diversity of our abilities, beliefs, experiences, and perspectives. We honor our differences and explore what they mean for us. Everyone has the right to their own emergency. Everyone has the right to choose for themselves how to handle it. All voices are real. All voices matter. If it’s not working for all of us it’s not working. Nothing about us without us. Issues are negotiated openly and honestly by everyone who is affected. We don't speak for others or substitute our judgment for their own. We offer others the same dignity and regard we would like to receive if the tables were turned. We grapple with the reality of vulnerability, pain and loss, instead of blaming, labeling or counseling others. Relating is often more helpful than helping. A living example is worth a thousand words of advice. The respect we offer each other when the going is rough will determine the quality of the community we end up with. Risk is inherent in being human. Safety is not a result of liability management. Safety is a quality of trusting relationships. The safest we will ever get is by learning to offer each other relationships worthy of trust in our times of greatest need. If we lack the ability or will to create trustworthy relationships for our own people, we can't expect the public at large or psychiatry to do this for us. It has to start with us - right here, right now. So let it begin with me. If I can, I will listen in to the call tonight. Love everything you have written on your blog. thank you so much! Look forward to connecting soon!